OSS war documentary “The War Department Report” leaves mark at the University of Utah. Director Lundquist was described by the Central Intelligence Agency as “a talented architect and industrial designer” who worked for the Office of Strategic Services, the CIA’s predecessor during World War II. Lundquist also created the logo for the United Nations as well as the one for Q-tips. Originally the film was intended to remain “a restricted government film” and was “destined chiefly to be displayed before war plant workers.” (“Cary Grant”) However, it was later publicly released, which eventually earned the film an Academy Award nomination for Best Documentary Feature. The War Department Report is still viewed today, primarily used in military training. The OSS is highly praised for the film’s exposure of the war. Katz writes, “Through their pioneering experiments in the visual display of information … in service of the War Crimes trials … they left a small but indelible mark on history.” The film is kept today in the Academy Film Archives. Today, free screenings of recent films remain available to University of Utah students. However, the 1944 viewing of War Department Report stands out among many because students were able to see in real time the reality of the war via footage from the enemy’s perspective. The film is still highly acclaimed today and remains an important asset for military training purposes. Ellie Cook is a third-year student at the University of Utah studying communication (journalism) and psychology. She has written for Trend Privé Magazine and U NewsWriting. War Department Report. Oliver L. Lundquist, director. United States: U.S. Office of Strategic Services, 1943. “Cary Grant, McCarey Team on Comedy Plans … ‘War Department Report’ Gives Pessimistic Outlook,” Los Angeles Times, December 21, 1943, 8. “Impromptu War Film Showing at U,” Salt Lake Tribune, February 2, 1944, 8. “New War Film Shown In S.F.,” San Francisco Examiner, February 2, 1944, 7. “Students see War Pictures,” Utah Chronicle, February 3, 1944, 1. “Documentary (Feature Subject),” The 16th Academy Awards. Katz, Barry. “The Arts of War: ‘Visual Presentation’ and National Intelligence,” Design Issues 12, no. 2 (Summer 1996): 3–21. “The OSS Architect Who Designed the UN Logo,” Central Intelligence Agency, June 23, 2017. War Department Report, American Film Institute Catalog of Feature Films. Photo accompanying Bob Hale’s article, “Russ Good until Spring, Kaltenborn Believes,” that was published in The Salt Lake Telegram, October 15, 1941. According to journalism historian Louis Liebovich, Hans Von Kaltenborn was an extremely popular and important radio broadcaster throughout the 1940s and was the “most listened to foreign affairs commentator of the time.” Kaltenborn’s radio broadcast was regularly listened to by anywhere from 10 to 17 percent of American homes during the years 1942 through 1947, meaning that his program “reached a larger portion of the American public across the country than any other single news opinion source with the exception of Time magazine.” His influence greatly shaped American discourse by stimulating newspaper editorials, effectively attacking high-ranking government officials, and shaping public opinion of government policy (Liebovich, p. 47). Kaltenborn’s popularity was certainly evident in the tone of the coverage before and after the event by The Utah Chronicle and the Salt Lake Telegram. The October 15, 1941, issue of the Telegram called Kaltenborn the “No. 1 news commentator” and from the moment he landed at Salt Lake airport the paper reported on his observations of the war in Europe and specifically “the Russian fight against the invading Germans.” The Salt Lake Telegram’s subsequent October 16 issue reported that these topics were also addressed during Kaltenborn’s speech when he said that Hitler’s invasion of Russia was going so poorly that even Hitler admitted he had made an error. Less than two months after Kaltenborn’s speech in Salt Lake City, millions of Americans across the country tuned in on December 7, 1941, to hear his analysis of the attack at Pearl Harbor, which heralded the United States’ entrance into WWII (National Broadcasting Company, Inc.). The timing of Kaltenborn’s speech, his outspoken position on the war, and the media coverage before and after the event provide a great insight into the contemporary arguments for and against entering the war and can help to better understand the political landscape of Utah concerning the war prior to Pearl Harbor. Anthony Scoma is a senior at the University of Utah majoring in communication and political science and is set to graduate in May 2019. He is interested in radio journalism and is the podcast producer for K-UTE Radio. “H. V. Kaltenborn Opens Master Minds Series,” The Utah Chronicle, October 9, 1941, 1. Bob Hale, “Russ Good Until Spring, Kaltenborn Believes,” Salt Lake Telegram, October 15, 1941, 15. “Hitler on His Way Out, Says Kaltenborn” Salt Lake Telegram, October 16, 1941, 11. Wallace Bennett, “Famous News Analyst Sees Need for Unity,” The Utah Chronicle, October 16, 1941, 1. Hays Gorey, “Noted News Lecturer Shows Weakness in War Problem Analysis,” The Utah Chronicle, October 23, 1941, 4. National Broadcasting Company, Inc.“H.V. Kaltenborn’s Analysis Of The Japanese Attack On Pearl Harbor,” December 7, 1941. Liebovich, Louis. H.V. Kaltenborn and the Origins of the Cold War: A Study of Personal Expression in Radio Journalism History, no. 14 (Summer/Autumn 1987): 46–53. Doug Fabrizio was born in 1964 in Bountiful, Utah. He studied at the University of Utah and began working and reporting for the KUER broadcasting station in 1987. KUER is a public radio station and is a member of National Public Radio (NPR). Its mission is simple: the station is “committed to building a community of world citizens through story and art, discussion and debate, sound and creativity.” (“About KUER”) The station is broadcast from the University of Utah and listeners around Utah tune in. Fabrizio began working at the station when he was a junior in high school. By 1993, he had assumed the position of news director of KUER. (Sheehan) Then, in 2001, Fabrizio began hosting a radio segment, RadioWest. The show is “a radio conversation where people tell stories that explore the way the world works. (“About RadioWest“) In an interview with CityWeekly, Fabrizio expressed his views of the shows’ particular content, “Art and culture are an important part of the program. I actually don’t believe in segregating news – keeping the hard stuff from the softer stories (in fact I hate describing arts coverage or features as ‘soft’) or the local ones from the national ones. No matter where it comes from, most of us don’t see music or literature or great film as any less important to our lives than knowing about the critical events and issues of the day.” (Sheehan) Fabrizio has had the chance to interview many influential people throughout the years, from Madeleine Albright, the first woman in the United States to become secretary of state, to the Dalai Lama. Doug Fabrizio became host and executive producer of KUER’s RadioWest in 2001. Photo courtesy of KUER. 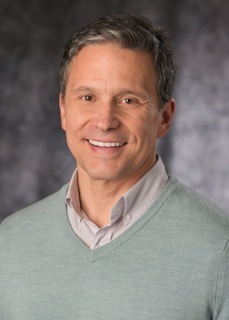 Fabrizio’s work has been recognized by many organizations, including the Public Radio News Directors Association, Society of Professional Journalists, the Utah Broadcasters Association, and the Academy of Television Arts & Sciences. RadioWest has steadily progressed throughout the years and Fabrizio’s style has evolved using storytelling mixed with honest interview question and answers. Fabrizio has profiled a number of topics, Utahns, and intellectuals, including the documentary, Ab Jenkins and the Boys of Bonneville, Everett Ruess, University of Utah President Chase Peterson, Congressman Ron Paul, David Foster Wallace, Nobel Peace Laureate Mohamed ElBaradei, and Robert Redford. These profiles incorporate Fabrizio’s storytelling approach. “The Boys of Bonneville” segment aired on August 24, 2011. The segment featured the story of Ab Jenkins, who sped across the Bonneville Salt Flats and set record speeds. Fabrizio interviewed the director and others about the new documentary. Fabrizio introduced the piece with a simple introduction, setting the scene of the Salt Flats, a landmark not as well known by Utah residents as one would think. Fabrizio had four separate guests on the program; he kept the atmosphere relaxed. Fabrizio focused on Everett Ruess, a young man who disappeared in the Utah desert, for a segment that aired on July 13, 2011. The tone was more serious as Fabrizio interviewed David Roberts, a writer who had thought he had found the body of Ruess. Fabrizio carried the piece by asking the tough questions first, and using basic interview skills. The piece doesn’t provide answers for where Ruess lies, but Fabrizio explores Ruess’s story and invites Roberts to discuss his chronicle of Ruess’ adventures. University of Utah President Chase Peterson sat down with Fabrizio on May 7, 2012, to discuss his new book, The Guardian Poplar. The segment was carried by Fabrizio’s tone. He had respect for Peterson, which was evidenced by his very candid introduction. Fabrizio listed Peterson’s accomplishments and then let him do the talking. Peterson was humble and quiet and shared stories that appeared in his book. Fabrizio’s technique gave Peterson the stage and allowed the story to speak for itself. Peterson had been diagnosed with cancer and believed he only had a few years to live. But, he outlived his death sentence and Fabrizio’s presence put him at ease to share his struggles and joys. Musician La Monte Young, who was born in Idaho and worked on a family farm on Utah Lake, has influenced some of the great artists. In a show that aired November 29, 2013, Fabrizio interviewed Professor Jeremy Grimshaw from Brigham Young University, who wrote a biography about the musical protégé. Fabrizio was knowledgeable about the guest and artist, but he asked open-ended questions that led to further discussion and allowed Grimshaw to discuss the complex character and Young’s musical compositions. Fabrizio’s technique allowed for a more in-depth approach that yielded untouched information. Congressmen Ron Paul spoke at Utah Valley University in October 2012 and conducted a question and answer afterward with the students. Fabrizio’s segment took listeners inside the discussion and allowed people to share in the conversation. Fabrizio began with his simple introduction approach and allowed the congressmen to greet the viewers. Then Fabrizio facilitated the Q and A session. David Foster Wallace was an acclaimed writer who committed suicide. D.T. Max, a New Yorker staff writer, wrote a biography of Wallace and joined Fabrizio’s show by phone to tell the story. The piece began with an introduction of Wallace and Max, which gave the audience an immediate feel for both parties. Mohamed ElBaradei, a Nobel Peace Laureate, came to Utah in September 2012 to talk about his international atomic energy plans. He also joined Fabrizio for a RadioWest interview. The piece had a serious tone in keeping with a newsworthy international discussion. Biographer Michael Feeney Callan chronicled the life of Robert Redford in his book, Robert Redford: The Biography. Callan spent fifteen years speaking to Redford and discovering his ways before finishing his book. Fabrizio introduced the September 2011 program with a story of Redford’s search for art and wanderings and then allowed Callan to discuss his book and findings about the infamous founder of Sundance Film Festival. The early 1900s began the trend of the national radio craze throughout America. It all started with young teens from Utah, much like Fabrizio. In 1909 these kids began the first Radio Club in Salt Lake City. They transmitted and broadcast segments over the airwaves. (Larson and Avery) Fabrizio has continued to carry on the young Utah tradition and has transformed his broadcast to feature several storytelling techniques. He uses the airwaves to tell the stories, which carry communication to Utah and the rest of the nation. Fabrizio’s broadcasts since 2009 can be found online. Archiving is an ongoing project. Hanna Tatro graduated from The University of Utah in May 2014 with a Bachelor of Science degree in journalism. Biographical sketch, Doug Fabrizio, RadioWest. Doug Fabrizio, “Boys of Bonneville.” RadioWest. Doug Fabrizio, “Finding Everett Ruess,” RadioWest. Doug Fabrizio, “The Guardian Poplar,” RadioWest. Doug Fabrizio, “The Music and Mysticism of La Monte Young,” RadioWest. Doug Fabrizio, “Congressman Ron Paul,” RadioWest. Doug Fabrizio, “The Life of David Foster Wallace,” RadioWest. Doug Fabrizio, “Nobel Peace Laureate Mohamed Elbaradei,” RadioWest. Doug Fabrizio, “Robert Redford: The Biography,” RadioWest. Tim Larson and Robert K. Avery, “Utah Broadcasting History,” in Utah History Encyclopedia (Salt Lake City: University of Utah, 2009). Gavin Sheehan, “Doug Fabrizio,” City Weekly, July 10, 2009. Fox immediately established a new and innovative way to build revenue for KDYL. He knew it would have to come through advertisement. In fact, much of his own success in broadcasting (radio and television) was based upon his ability to sell advertisement in new, inventive ways. (Boyles, 27) Over the next ten years, Sydney S. Fox continued to improve and build up revenue and the popularity of KDYL. Fox’s focus shifted from radio to television in 1939 after he attended the World’s Fair in both New York City and San Francisco. This is where he saw television demonstrated for the first time. Fox’s drive and enthusiasm quickly turned to developing a local television station in Salt Lake City under the KDYL name. He felt that the possibilities of this new form of medium were unlimited and all of his time went to making it a reality in Salt Lake City. Fox knew that it would be a sensation, but he failed to see how much of an impact it would have on the local Salt Lake City community. He began to demonstrate local television at state fairs and at public demonstration days at local department stores in downtown Salt Lake City. The turnout was outstanding. Following several applications to the FCC, he was granted an experimental license in 1941. However, the timing was not meant to be. Shortly after obtaining a license, the onset of World War II halted any further progress. That was until 1946, when RCA began production of television transmitters once again. 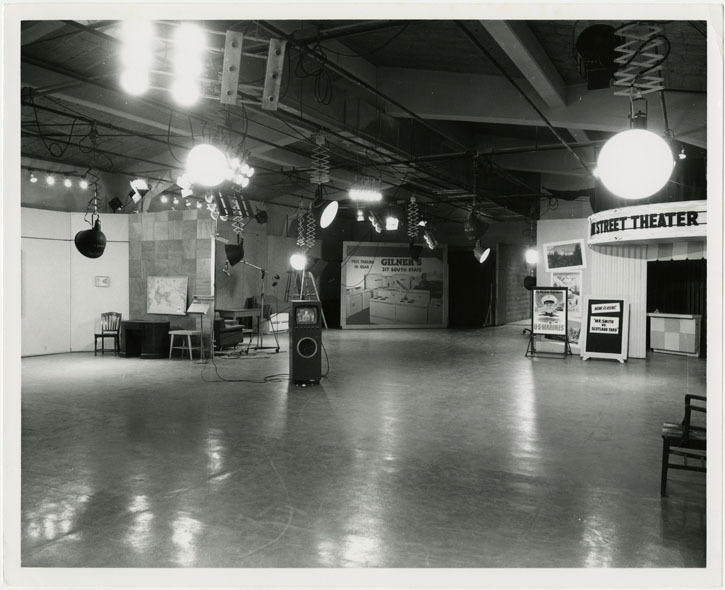 Inside the television studio of KDYL-TV. Photo courtesy of the Special Collections Department, J. Willard Marriott Library, The University of Utah. 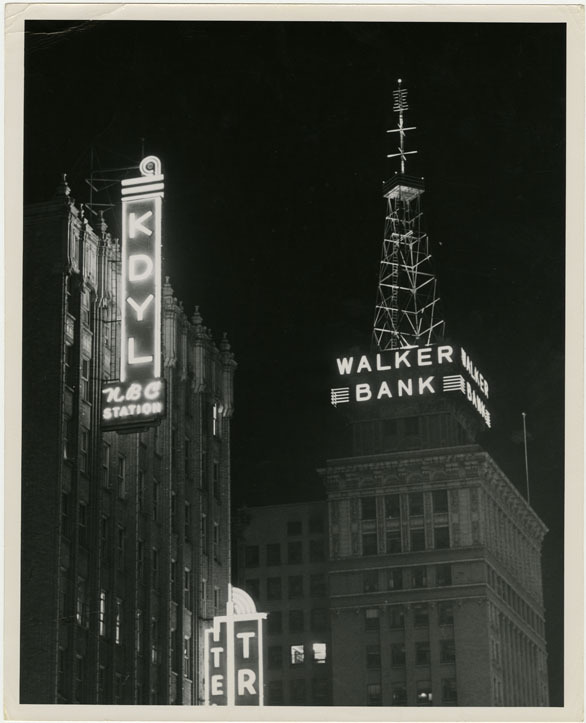 KDYL, with a recently purchased transmitter, began to build a transmitter on the top of the Walker Bank and Trust Building in downtown Salt Lake City. A full television studio was also built at the Regent Street Playhouse on 68 Regent Street. (Boyles, 39) Then, with the approval of a television broadcasting application in 1946 by the FCC, KDYL began transmitting by November as KDYL/W6XIS. (Boyles, 40) These transmissions soon turned into regular programmed media in April 1948, and thus launched the first independently owned television station in the United States. KDYL, going by the call sign of W6XIS, continued to provide independent programming for the Salt Lake City community until early 1953, when KDYL was sold to TIME Inc. for just over $2 million. Yet by 1938, full-page articles were being printed within newspapers featuring the progress of the television. The Kane County Standard printed such an article titled “Television, Science’s Youngster, Starts Wearing Long Trousers.” In this article, Joseph W. LaBine focuses on progress of the invention and notes that the “bugs” had been eliminated. “Actually, RCA’s engineers have already ironed out most of the ‘bugs’ in transmission.” It may have been articles such as that one that focused on the television that influenced Sydney S. Fox, president of KDYL in Salt Lake City, to pursue the concept of television. Sydney S. Fox with two of KDYL-TV's engineers, including head engineer John Boldwin (far right), inside main control room at KDYL. Photo courtesy of the Special Collections Department, J. Willard Marriott Library, The University of Utah. KDYL's downtown building next to the Walker Bank building in Salt Lake City. The KDYL-TV transmitter was located on top of the Walker Bank Building. Photo courtesy of the Special Collections Department, J. Willard Marriott Library, The University of Utah. The inaugural program was graced with the presence of the Utah governor, the Salt Lake mayor, and Frank Streator, president of the Chamber of Commerce. (“Salt Lake 13th to Have Television”) Along with KDYL-TV being the first station west of Kansas City, it also set another milestone by being the first independently owned television station in the nation. KDYL became a pioneer for what television would become and mean as a local informational source in the United States. 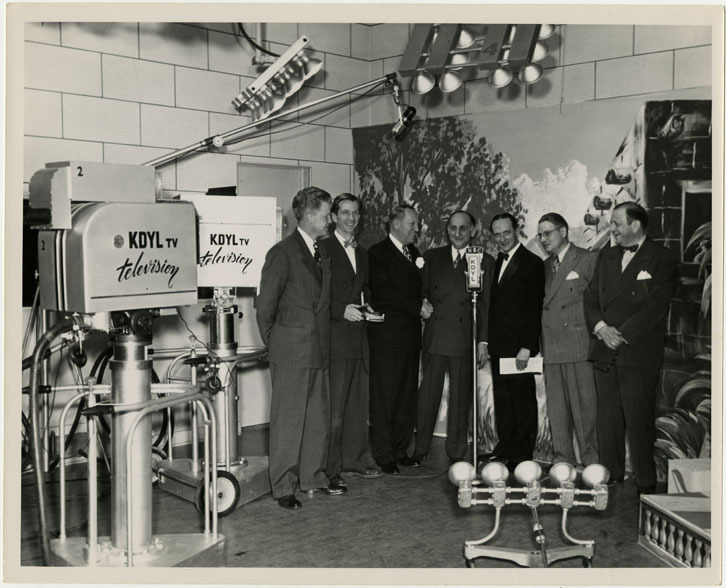 A group of men, including Sydney S. Fox (center) addressing a TV audience on a live broadcast from KDYL-TV studios. Photo courtesy of the Special Collections Department, J. Willard Marriott Library, The University of Utah. KDYL-TV continued to set the pace for local television. “In late July the station’s mobile unit was delivered, which made possible the telecasting of events away from the studio.” (“KDYL-TV Laid Plans for Video”) This also brought sporting events to viewers at home. The Salt Lake community would soon be able to watch a wide range of sporting events from their own front room. This became a true pioneering television station, which played a major part in the Salt Lake community. Sydney S. Fox and his team at KDYL helped pioneer and develop early television station standards that directly impacted the Salt Lake community and the rest of the nation by being the first at many aspects of broadcasting, including: first independent television station, first to air golf and downhill skiing, first to challenge the nation’s use of locally scheduled broadcasts by providing local broadcasts seven days a week from 9:30 a.m. until midnight. The station also pioneered ways of gaining advertisement space on local television. Sydney S. Fox continued to work within television after leaving KDYL and pressed the concept of entertainment with the idea of producing movie-like television shows. Sydney S. Fox truly helped drive local television into the news, information and entertainment source that it has become, and his desire for the public to witness television still lives today as KDYL continues to air local programming under call number KTVX in Salt Lake City. Jason Bushnell is a senior studying mass communication at The University of Utah. He is set to graduate following the Fall 2012 semester. He will be continuing a career within television broadcasting. “Seeing By Wire,” The Deseret News, April 12, 1910. Joseph W. LaBine, “Television, Science’s Youngsters, Starts Wearing Long Trousers,” Kane County Standard, January 7, 1938. “Salt Lake Concerns To Show Television,” Davis County Clipper, September 15, 1939. “Television Set To Be Exhibited,” Salt Lake Telegram, September 10, 1940. “S.L. Radio Executive Says Industry Eyes Television,” Salt Lake Telegram, October 12, 1943. “KUTA Files Application For Television Station,” Salt Lake Telegram, June 3, 1944. “S.L. Firm Asks to Build Television Station,” Salt Lake Telegram, September 23, 1944. “S.L. Firm Granted Television Permit,” Salt Lake Telegram, December 30, 1944. “Salt Lake City 13th To Have Television,” Salt Lake Telegram, April 21, 1948. “Department Store Sees Television,” Salt Lake Telegram, May 28, 1948. “S.L. Station Expands Television Schedule,” Salt Lake Telegram, July 7, 1948. “Get Television Permit,” Salt Lake Telegram, July 30,1948. “KDYL-TV Laid Plans For Video in ’39,” Salt Lake Telegram, May 31, 1951. “Sale Of DKY-TV OF Salt Lake City To Time, Inc. Stated,” Davis County Clipper, July 24, 1953. Patrick Wm. 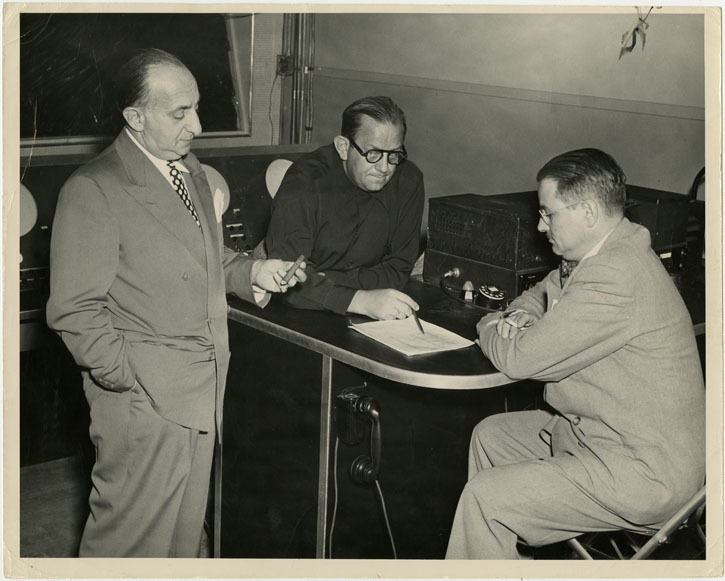 Boyles, Sydney Fox and KDYL, 1927-1952: A Utah Broadcasting History (M.S. thesis, University of Utah, 1953).